If you compare historical photos of glaciers with those taken more recently, you can see that where there was formerly ice, there is now very often nothing but rock. Geographers, however, are less interested in the area covered by a glacier, and more interested in its mass. Researchers from Friedrich-Alexander-Universität Erlangen-Nürnberg (FAU) have now investigated all glacial areas in South America in more detail than ever before, from the tropical areas of Venezuela to the subpolar regions of Tierra del Fuego. 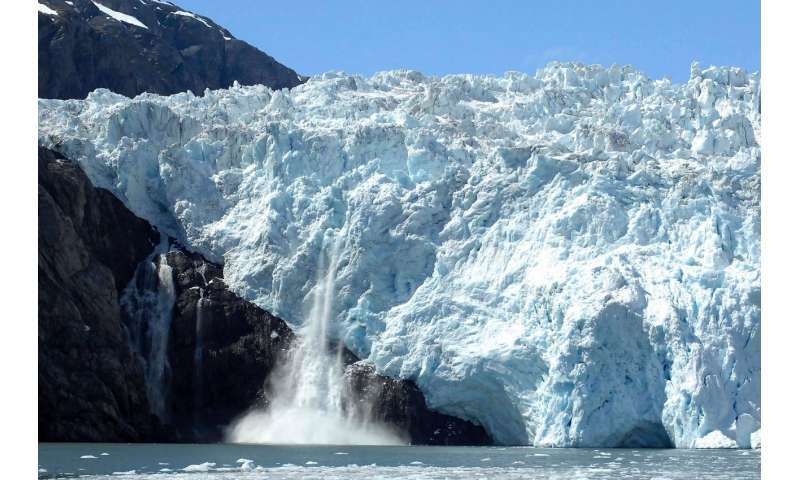 Their two major findings are that the highest rate of mass loss is in the Patagonian ice sheet, and that the glaciers in the tropics have lost considerably less mass than previously projected, although this is not the good news which it might appear at first sight. Surveying glaciers is nothing new. There are two methods used particularly often. In the first method, researchers take several measurements directly at a glacier and project the results for entire regions. This is particularly problematic when it comes to large glacial areas such as the large ice fields in Patagonia, as barely any in situ measurements are available for these areas. The other option is to take gravimetric measurements using satellites. Scientists base their measurements on the fact that gravity on Earth changes depending not only on the location but also over time. It is influenced by aspects such as the composition of the Earth's surface, mountain ranges, movements in the core, plate movements—and, of interest for our context, when glaciers lose mass. One disadvantage of this method is that when only small areas are covered by glaciers, as is the case in the South American tropics, the satellite only receives a weak signal and the measurement is significantly less accurate. Geographers from FAU specialising in climatology, remote sensing and spatial information, led by Prof. Dr. Matthias Braun and Dr. Tobias Sauter, also used satellite data for surveying South American glaciers, but they focused on calculating elevation levels instead of basing their results on gravimetric measurements. Two radar satellites from the German Aerospace Center (DLR) have been orbiting the Earth since 2010. The aim of the TanDEM-X-mission was to obtain a three-dimensional image of the Earth, which is not only of a consistent quality but also more accurate than anything that has been developed before. Differences in elevation were recorded down to the last metre. The researchers from FAU used data collected between 2011 and 2015 and compared it with measurements from the Shuttle Radar Topography Mission of 2000. Using a complex method that involved making corrections and calculating possible error margins, they compared the data to calculate the changes in elevation in the glacial regions of South America, thus obtaining an accurate picture of the changes in glacial mass. Their method was unusual in that they were able to use one uniform method to record all glacial areas in the region. In addition, the method even provided accurate data for individual glaciers. Comparing the measurements from both space missions provided detailed insights into the situation throughout South America. For the first time, researchers succeeded in analysing the large Patagonian ice fields separately from the surrounding, smaller glaciers. The greatest loss of mass, both relatively and in comparison to the other South American glaciers, was found in both inland ice fields in Patagonia, two regions with an area of approximately 18,000 square kilometres, roughly equivalent to the Rhineland-Palatinate region in Germany. The mass of the glaciers there shrunk between 2000 and 2011/2015 at a rate of approximately 17.4 gigatonnes per year, equivalent to 19.3 cubic kilometres per year. Not even glaciers in the tropics have lost such a large proportion of their mass. The reason could be that the large outlet glaciers in Patagonia, which flow into the ocean or lakes after passing through narrow valleys, adjust dynamically. They have retreated from a stable position and now have to form a new stable front. These processes have been observed in tidewater glaciers that flow into the ocean, and are not necessarily the result of climatic influences, although this may indeed be the cause. This phenomenon has an even greater effect on large glaciers such as those in Patagonia than influences triggered by changes in temperature. Previous surveys have already shown that entire glaciers have vanished, for example, in areas of Bolivia. It has now become apparent that this is also happening in Patagonia. The second important fact revealed by the research is that the mass of glaciers in the tropical regions of South America—in Venezuela, Columbia, Ecuador, Peru and Bolivia—is changing at a considerably slower rate than previously supposed. Projections to date calculated that the 2900 glaciers there were losing approximately 6 gigatonnes of mass per year. The geographers from FAU have discovered, however, that they are only losing 0.55 gigatonnes per year, approximately 10 percent of the estimates to date. This result is important, as glaciers are an important source of water in the dry period: When no rain falls and the temperatures reach their highest level, glacier melt water is used as drinking water, for irrigation and hydro power. People in these regions therefore have to know to what extent the glaciers are changing, and need quantitative data not only with respect to area but also in terms of their volume and mass. In some areas such as the Central Andes in Chile and Argentina or the Cordillera Real in Bolivia, experts are even of the opinion that the maximum amount of water available from glacial melt has already been exceeded. This is an indication that glaciers are irrevocably on the retreat and will vanish entirely in the foreseeable future. In future, these areas will have less water available during the dry season. Anyone on this site ever going to write an article on glaciers that explains that glaciers are not normal to Earth. And Glacier formation is a catastrophic event caused by low levels of greenhouse gasses. About 35 million years ago, while still in the North Pole, Antarctica was an ice free continent. This is an article that explains the lack of ice. Type it into your search because there are no links allowed on this site. While this initially seems like an ideal way to determine overall loss of ice coverage, it does have one serious flaw. For areas such as the Antarctic, where loss of ice has resulted in a significant rise in bedrock elevation, the true extent of ice loss would be masked if you went strictly by the satellite elevation measurements. There are many areas where the rise in bedrock elevation would not be very significant but it does still need to be accounted for, when the goal is to keep tabs on the overall ice coverage. Since radar can 'see' beneath the ice, perhaps for every measurement taken of the height of the ice, taking an additional radar measurement of the ground elevation at that point, would give much more accurate data for the extent of ice coverage.